I certainly remember watching this TV series and it was originally broadcast on ITV from 1976 to 1977. The most irritating character was Violet Elizabeth Bott (played brilliantly by Bonnie Langford) who could often be heard screeching "I'll thcream and thcream 'till I'm thick". William Brown was the scruffy leader of a gang of disobedient village boys, and as the cover of the annual shows us, making catapults using sticks and elastic bands was a regular pastime for young lads back in the 1970s - I certainly did! Not everyone was a fan of the smarmy Roger Moore playing agent 007, but the films were certainly a lot of fun. Moonraker was the fourth outing for Moore and the eleventh Bond movie overall. It cost a whopping $34 million to make (a ginormous sum in those days) due to its on-trend sci-fi theme, and also featured the legendary Richard Kiel as one of my favourite characters, Jaws. 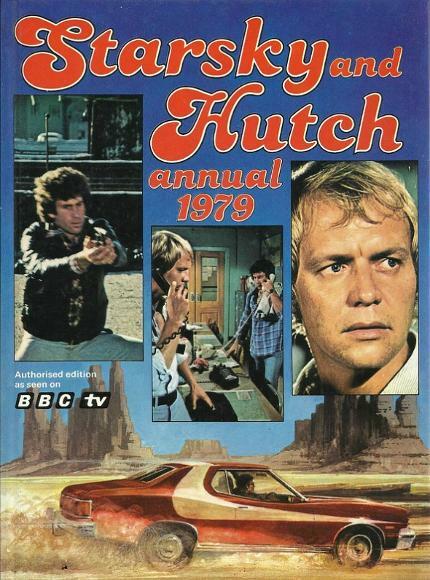 I always enjoyed staying up late on a Saturday night to watch the latest episode of Starsky and Hutch on BBC1. The American cop show originally aired from 1975 to 1979 on ABC in the U.S., but quickly developed a huge following here in the UK, with all kinds of merchandise becoming popular - who else received the Ford Gran Torino toy car for Christmas? 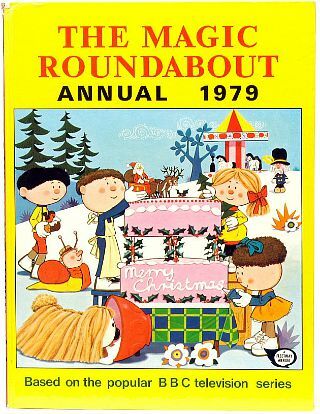 If you're of a certain age then you will know instantly recognise all of the characters featured on the cover of this annual. They are, of course, Miss Piggy and Kermit the Frog from The Muppet Show, David Soul from Starsky & Hutch, Henry Winkler (who played "The Fonz" in Happy Days), Liverpool footballer Kenny Dalglish and motorcycle road racer Barry Sheene. This amusing American sitcom ran for 11 seasons (ten years) from 1974 to 1984 and was set in the 1950s to 1960s. One of the most memorable and best-loved characters was the ultra-cool Arthur Herbert Fonzarelli (better known as "Fonzie" or "The Fonz") who's one-word catchphrases included "heyyy!" and "whoa!" 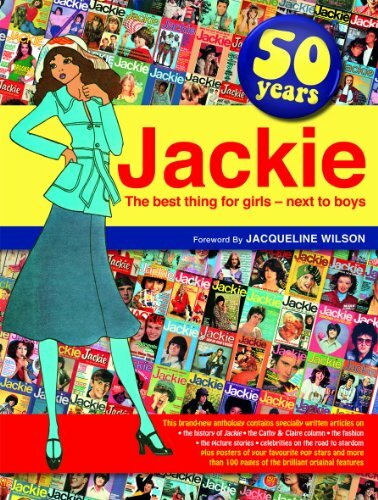 However, the main storylines were often based around the Cunningham family, with the red-haired teenager Richie (featured on the top left of the cover above) being the lead character in earlier seasons before the popularity of The Fonz grew. This is the official BBC TV annual featuring the legendary Tom Baker as the fourth doctor on the front cover. My favourite Doctor was the dandy Jon Pertwee, as I found the storylines from the Baker era often too dark. Maybe if I'd been a little older I would have understood them a little better, and I always found K-9 very irritating! This animated series was quite bizarre and featured a range of odd characters. The ones I remember were Zebedee the jack-in-the-box, Dougal the dog, Ermintrude the cow, Brian the snail, Mr Rusty the roundabout operator, Florence (a young girl) and Dylan, a sleepy rabbit (or was he on something?) who occasionally played the guitar. The original series ended in 1977 and so this annual is a little belated.